A Disgruntled Republican in Nashville: Democrats United with Labor mayoral forum canceled due to pressure from Freeman, organizer says. Democrats United with Labor mayoral forum canceled due to pressure from Freeman, organizer says. The Democrats United with Labor mayoral forum scheduled to take place tomorrow at 3PM at the International Brotherhood of Electrical Workers union hall on Elm Hill Pk has been cancelled at this late date, due to a pressure from local labor leader Gary Moore, according to the forum organizer. The organizer of the, Larry Crim, has scheduled a new forum, much like the one cancelled, for March 21st but the new forum will not have the participation of organized labor. 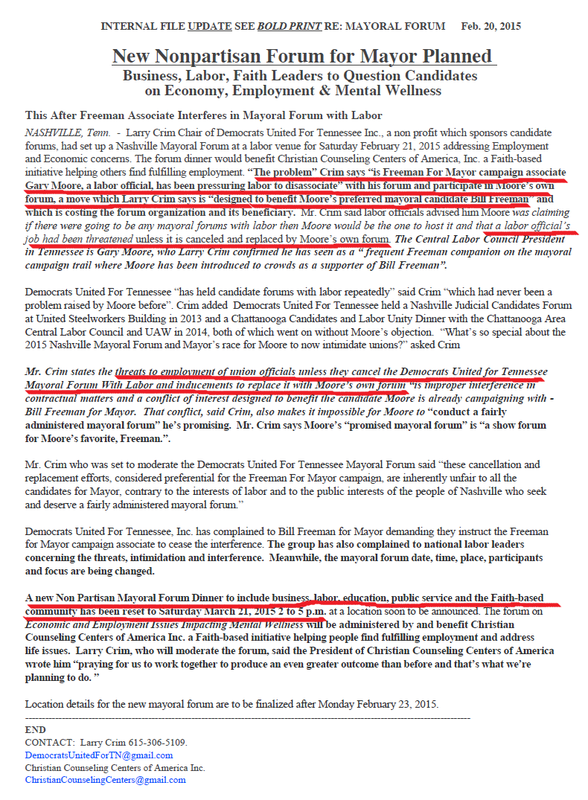 According to Crim the reason the Democrats United with Labor forum is cancelled is because the Freeman for Mayor campaign pressured labor to not participate. Below is a statement issued by Crim.